Home > Press Releases > A Free dB Alert Noise Level Warning Device On Orders Over £99! 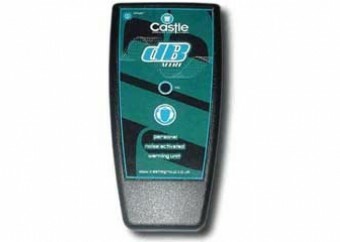 A Free dB Alert Noise Level Warning Device On Orders Over £99! Castle Group have launched a brand new promotion to reward the customers of their e-commerce shop, www.CastleShop.co.uk – Customers will now receive a free dB Alert for all orders over £99*. Worn by a worker, the device activates only when the noise exceeds a pre-set level – notifying the wearer that noise levels have become dangerous and to put on their ear-defenders – and weighing just 70 grams, the small mobile phone sized design allows workers to carry out their normal daily tasks without restriction. CastleShop.co.uk offers 1,500 measurement and monitoring products from a wide range of subject categories, serving business and consumers on a daily basis. Categories range from Noise, Vibration, and Air Sampling, to Lone Working, Communication Equipment, and PPE. Visit www.CastleShop.co.uk Now While Stocks Last. * – Order total must be over £99 before addition of VAT. Online orders only.